One of the latest additions to the Microgaming video slots is the excellent Avalon II. This game builds up a mystical scene from the moment you start playing it, with the music and excellent graphics really setting the atmosphere. It is the long-awaited sequel to the longest standing game in the Microgaming inventory, the original Avalon. The updates for version II of this game have made that wait worth-while, as it offers a master class in graphics, sound and features. Avalon II is designed to take you on a journey to find the magical Grail. You have a trail map that you can follow to find different clues and pick up various bonuses along the way. Merlin will make an appearance every now and then, and he magically produces some additional cash prizes and bonus rounds. Your main mission when playing Avalon II is to find the Grail that was stolen from its last resting place. You head out on your journey through the enchanted forests with the knights of King Arthur, and fight your way past the evils of the forest, and garner the help of people like Merlin, Guinevere and even King Arthur himself along the way. 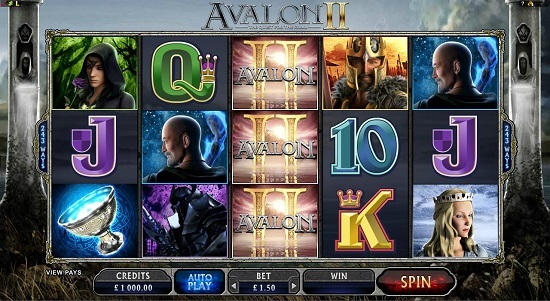 Avalon II is a 5-reel video slot game that that incorporates a variety of bonus features, Wild symbols and free spins. It is a very interactive game, and you are always having to make decisions on what you want to do next in your quest to retrieve the lost Grail. You will collect battle helmets along the way, and you can exchange these for treasure (bonus rounds and additional credit wins) as you go. Each time you play you can take different routes through the mystical forests, so it is certainly not repetitive at all. The medieval music that accompanies the game as you go through it really helps to set the scene and build up the anticipation. When you have the opportunity for any bonus rounds you are alerted by the excellent graphics and music. Another example of how Avalon II has improved and raised the bar for video slots even higher, is the addition of 3D characters within the game. As you go through the different elements of Avalon II you will see the main characters such as Arthur, Guinevere and Merlin appear in 3D animation. These are also accompanied by professional voice actor’s recordings, so it gives it that extra edge. These cinematic style graphics are game changing additions to this game, and will likely see a surge of other games using the same kind of effects now. This coupled with the exciting features and bonuses that Avalon II offers is likely to see this game reach the same heights as the original Avalon did. As mentioned, Avalon II is a 5-reel game which has a whopping 243 different pay lines. The minimum bet is just £0.30, so you do not have to spend a fortune to enjoy all that the game has to offer. The jackpot is pretty impressive too, and although it does not have a progressive jackpot you can win up to 2,400,000 coins, so some real opportunities to win some serious money when playing Avalon II. This game was released in February 2014, and has been added to the already impressive list of games in the Microgaming inventory. 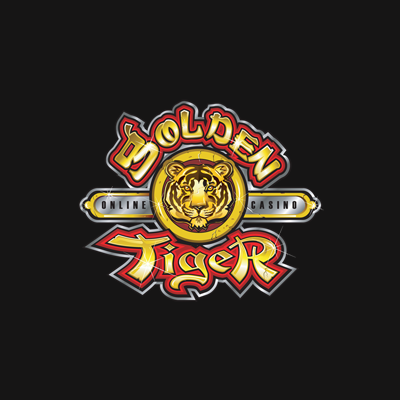 So when you join any of the Microgaming casinos you will get access to Avalon II right away. 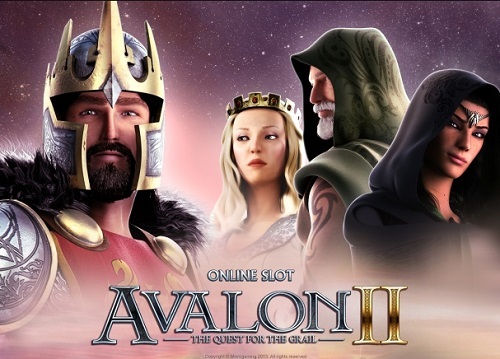 You can sign up and start playing Avalon II now at the casinos below.